November for Italy’s Nokia Windows Phones? iPhoneItalia and WMPU are reporting that Italy might be getting the new Nokia Windows Phone this year, and in November. 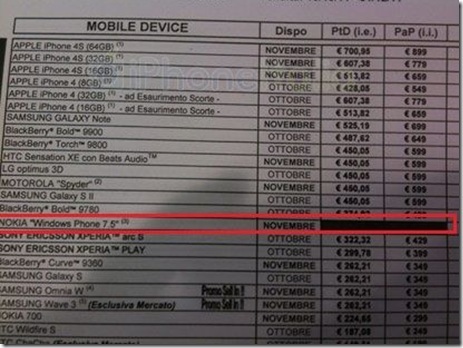 This info comes from Italian carrier TIM, showing upcoming handsets. Note that Nokia’s Windows Phone doesn’t seem to have a special name yet. It’s just called, “NOKIA WINDOWS PHONE 7.5”. Most likely, other launch countries will include UK, France, Germany, Netherlands and Spain. Those are the countries that don’t have the N9 and were once noted to be the 6 countries that would first launch with Windows Phone.